If you are born into the Chinese Year of the Dog, you are likely to be faithful, loyal, clever, and friendly - and the dog on this colouring page looks like he would be all of those things! This cute dog looks very happy that he's just been given some tasty food in his bowl! Print out this lovely picture then grab some crayons and colour it in. Choose a nice bright colour for this dog bowl, then colour in the dog food too! Here's a picture of a very adorable dog to colour in - I wonder what his or her name might be? "How much is that doggie in the window? The one with the waggly tail..." The lovely dog on this colouring page has a waggly tail and looks very happy indeed! This cute dog has picked up a very large bone! Ask the kids to grab some crayons and colour in this lovely picture. Here's a simple colouring page featuring a happy doggy face - great for younger kids. 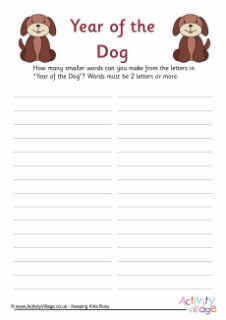 You could even print this page onto some card, colour in the picture, then cut around the edges and cut out holes for eyes to make a simple dog mask! There are lots of things to colour in on this fun colouring page, all about puppies! Print out and colour in this lovely picture of two puppies playing and having fun! This cute puppy looks like he'd love some attention! Print out this lovely picture then colour him in. Here's an adorable puppy ready to print out and colour - I wonder which colour spots you will give him? Wish someone a Happy Chinese New Year by colouring in and sending this lovely Year of the Dog card. Ask the kids to grab some crayons or felt tips and have some fun colouring in this lovely Year of the Dog colouring page.